A few posts back, I wrote about the collaborative project that helped maintain my excitement for sewing during an otherwise difficult period in my life. Today, I want to introduce another project that I am crediting with re-introducing me to sewing on a semi-regular basis. Like The Traveling Quilts, this is another collaborative endeavor … but one unlike any other with which I've been involved. As my long-term readers know well, I've always been a fan of virtual quilting bees. Heck, I've been involved in many, many of them. And in most cases, unless Ryan or Scott were playing along, I was always the only guy in the group. I never imagined that the day would come when there would be a bee with more men than women in it … never mind a bee made up entirely of manquilters. Well, that day has come! 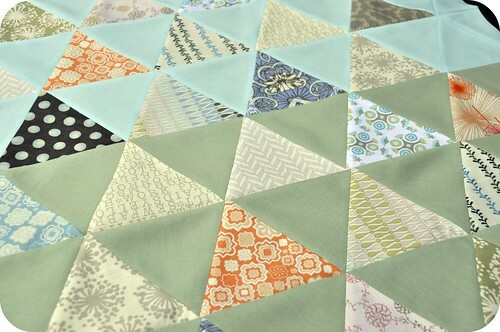 Allow me to introduce the No Girls Allowed Quilt Bee (with, of course, its own hashtag: #NGAQB.) The admittedly tongue-in-cheek name (no offense, ladies!) celebrates a full roster of talented and modern male quilters that will be sewing with and for one another for the duration of 2014. Each month, I'll be sharing the blocks I'm making for the other members of the group. And, I'll be featuring a short bio of each of the other guys so that you can get to know them as well. It's been a blast getting to know these guys already -- you should see some of the private conversations we've been having on Facebook! -- and I can't wait to see what the year holds for this fantastic group, as well as the majestic (and manly) quilts that are sure to come from it. Look how big they're getting! Just a quick note today to share one of my favorite recent pictures of my family. This is the shot we used for our Christmas card this past year. 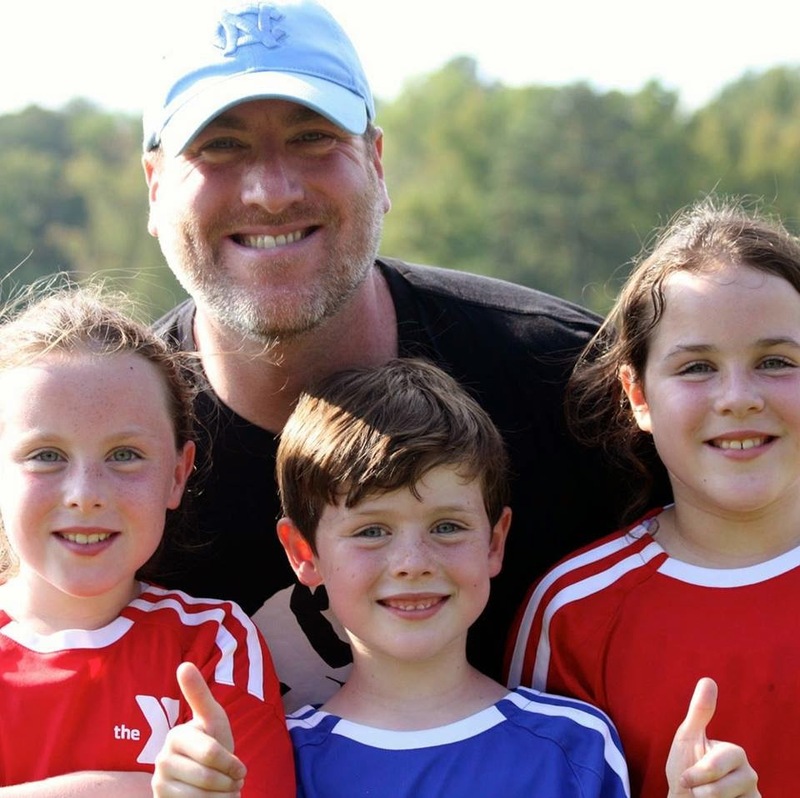 Since we spend most of our free time on the soccer field these days, it seemed appropriate! After the sewing bug bit, I guessed it wouldn't be long before the blogging bug bit too. I've been thinking for weeks about coming back to this space and starting to flex my blogging muscles a bit again. (Boy, are they stiff!) Truth be told, the longer I've been away, the more intimidating and overwhelming it's been to come back. Where to start? What to show? Am I ready to commit to this again? Well, there's no better place to start then the page of draft posts that I started months (years?) ago, pick one out, and just get git r done. So today I'll start with a project that, in many ways, kept me engaged with sewing and quilting when nothing else could seem to. 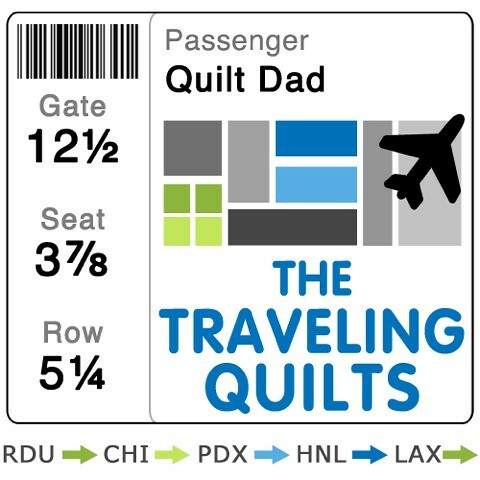 Even though I haven't posted about it before, by now you may have heard about The Traveling Quilts project. I can still remember long, long ago when I was chatting with Heather about our shared desire to participate in a collaborative project, but something different from a more traditional online quilting bee or round robin. We decided on a slightly different premise: create something -- anything -- and send it to the next person in the group. That person can add on to your creation in any way they choose -- no specific block styles, sizes, shapes, or colors. They could add to one side, two sides, three sides, or all four sides of the quilt. Or no sides, meaning that they might choose to just create a standalone addition and leave it to a quilter down the road to figure out how to put them together. That quilter is allowed to let inspiration guide her. And once they feel like their contribution is complete, they pass it along to the next participant. In the end, the person who holds the quilt before sending it back to its original home has a special duty. That person must quilt the finished piece and bind it. That way, every participant in The Traveling Quilts project actually receives a finished quilt in the end, instead of a collection of blocks. Once we hammered out the idea, we set out to assemble the group of quilters that we wanted to take this journey with. We were a bit worried that this new take on a virtual quilting bee might not be appealing to folks, but we shouldn't have worried. We ended up with an absolutely amazing group of people full of so much talent and creativity that it's almost intimidating. and me, here in North Carolina! For the start of my traveling quilt, I had a great time pulling together an electric group of prints that seemed very beach-y to me (without being overtly themed.) I was more inspired by the idea of sea glass than anything. I think these days it might be considered "low volume?" Anyhow, I absolutely loved compiling the muted tones and patterns and couldn't wait to see what everyone would do with them. 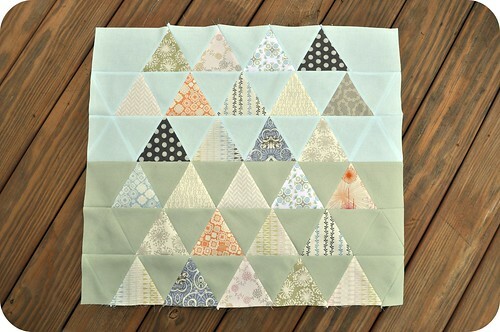 I paired the prints with a pale blue and a pale green and took a stab at some 60-degree triangles. And with that, I sent it off to begin its journey with Amber in Hawaii! Oh, one more thing: we each included a journal with our quilts for all participants to record a short note or memory of the experience and their additions to each quilt. Is it strange to say that I am as excited to receive that journal back as much as I am the quilt? I was going to share my additions to the quilts that have passed through North Carolina thus far, but I think I'll save that for another post. Happy Monday, and have a great week everyone!